The Documentary Project - Volume 6: "Exit Through the Gift Shop"
"Exit Through the Gift Shop" is sort of a documentary within a documentary. Or at least that's what it positions itself as, which is indeed a big part of its intrigue. We begin with Thierry Guetta, a French businessman whose feels his Los Angeles lifestyle isn't complete without a video camera in his hands. He films everything from normal, every day occurrences to the big events of his family. Upon a visit to France, Thierry meets a cousin of his who goes by the name Space Invader and is a well known figure in the underground street art world (read: "graffiti"). Fascinated by Invader's work, Thierry begins following him and his compatriots around at night, filming their exploits and soon becomes a fixture of the street art world himself. Thierry sets his sights higher, though, and uses his connections to get an introduction to Banksy, the world's preeminent street artist. 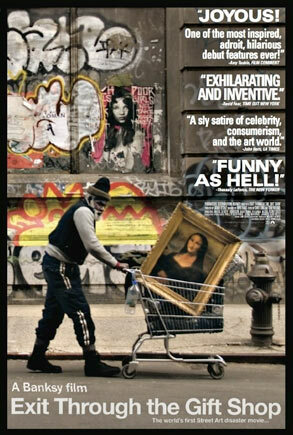 Thierry does several projects with Banksy, all the while shooting footage for a film that doesn't really exist. When Banksy asks Thierry to show him his documentary, Theirry puts together a hasty, haphazard film that alerts Banksy to the fact that his would-be biographer (as it were) is simply a determined fan. Intrigued, Banksy flips the script and turns the camera on Thierry, tasking him with developing his own brand of street art and documenting the results for the viewer. I can hardly think of a film that has caused me more writer's block than "Gift Shop." I've had a devil of a time trying to frame my thoughts into words and more importantly, to pinpoint what exactly there is to analyze. In truth, there's not a whole lot of content in this movie to critique or discuss. That's not to say it's a bad movie. In fact it is extremely well made and wholly compelling. I rarely sit and watch a movie without at least flipping through Twitter on my phone or doing a bit of work on my laptop. That's just what I do. Otherwise the ADD takes over and I can't concentrate on the film. With "Gift Shop", however, I sat staring at the screen for 87 minutes, my brow furrowed and my arms crossed, trying to decipher what in the world I was watching. It is clear (whether you've followed the movie's backstory to this point or simply come across it on Netflix Instant) that the goal of "Gift Shop" is to mess with your head first and inform (read: "advertise") second. Banksy is a shrouded figure, his face un-shown and his voice auto tuned. Yet it becomes readily apparent that the relationship between himself and Thierry is much closer than documenter and subject (even after they switch places). I'm not sure exactly what that relationship is and I suppose that's the point. It seems easy to me to say that Banksy and Thierry are the same person or at least are working together to display Banksy's work and heighten his notoriety. But that feels overly simple and the presentation is so obvious as to leave me wondering if that isn't exactly what Banksy/Thierry/whoever the freak this guy is wanted me to think. The mind game would be quite annoying, honestly, if it weren't so darn interesting. In the days following my "Gift Shop" viewing, I routinely found myself absentmindedly thinking about the film, trying to figure out what my own personal conclusion is. And to be frank, dear readers, I'm still not sure. It's a weird, twisted, even frustrating documentary (if it can even be called a documentary which I'm not sure it really qualifies for) that you should honestly just see for yourself so that you, too, can be confused and maddeningly intrigued.